There are many crossbow brands easily available from your local stores or even internet. But, have you ever thought of making a.k.a DIY your own crossbow? Follow our guides so that you can master the skill on how to make crossbow without any hassle, and the most interesting thing is, DIY crossbow can actually be functional. First, start off by constructing the body of the crossbow first. 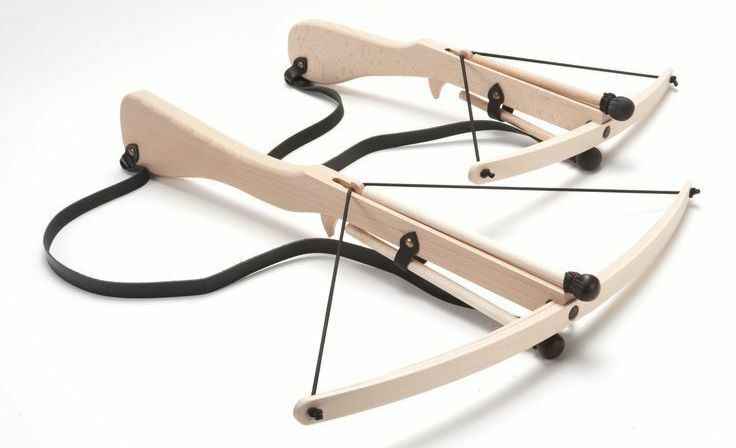 We will be making a wooden crossbow in this tutorial. The first thing you have to do is to measure the wood for the stock. ​Start off with a pine board that is 2 inches tall, 38 inches long and 2 inches wide. Then you have to hold it like you are holding a rifle to see if the length fits. When you find the right length, you want to mark it. Then you will have to saw the extra wood. For this step, you will have to use a hand saw or a circular saw so you can cut on the mark that you made. Be sure to use safety glasses and saw in an area that is ventilated. Now you should mark the area where the trigger should go. Hold the wood like you are holding the crossbow, and make a mark on where it feels good to have the handle and the trigger. Draw a rectangle shape that is 1 inch wide and 4 inches long. Cut the rectangle shape out of the marked place. You can do this by using a wood rasp, chisel, and drill. Then, you have to take the shape out of the wood, without splitting the wood. When you get it out, use a sandpaper for smoothing out the area where the hole is. Make the groove hold the string. The groove will make a place where the string is going to be placed horizontally right across the hole. Use a wood rasp or chisel so you can make an eight of an inch groove that is near the front of the hole for the trigger. Cut the groove holding the bolt. This one will be placed from the end of the wood to the rectangle hole. You will make this using a chisel, drill and a hammer so you can carve a quarter inch channel. Make the grip where you can hold while shooting. For this, you will need a second piece of wood that should be about 8 inches long, and you have to attach it to the bottom of the stock. Use a PVC pipe that is 36 inches long. Cut grooves into the ends of the pipe large enough for a wood screw. Now you have to attach the pulleys to either end of the pipe using wood screws so the string can feed through them. The string needs to thread through both pulleys. Tie the string on the left end, then pull it to the right end where you will loop it around the pulley, then bring it back to the left end to loop it again around the pulley and at last tie the string on the right end. Carve a groove in the stock where the pipe will fit by using a chisel or wood rasp on the end of the stock. Now secure the bow to the stock using duck tape. Draw an l-shape in the wood. Cut this out and use it as the trigger. Make a groove on the trigger across the short part. Now make a hole by the corner of the L, big enough for a nail so you can attach it to the stock. Then attach it on the stock through the rectangle shape making sure it has space to move. By following this easy guide, you will master the skill on how to make crossbow that is functional in no time. Be sure to check out tutorial around the internet and also from Youtube too. However, if you think making your own crossbow is time-consuming, you should probably look for crossbows which are good in quality yet affordable at the same time.